Welcome to ChampionConcreteCutting.com. Champion Concrete has been in business in Tulsa and surrounding areas since 1974. We will travel to any state. 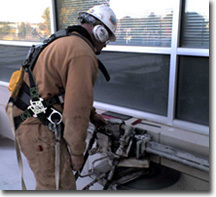 We are a complete concrete sawing company specializing in all fields of the concrete cutting industry. We look forward to the opportunity to bid on your next project. We are also looking into becoming a �go green� company. Please help our environment for future generations. We will do whatever it takes!